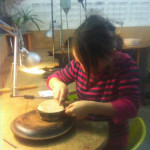 Do you want to learn to Make Silver Jewellery in London? If you prefer weekend learning, our short courses in jewellery making present the perfect opportunity to immerse yourself in the process of making. Our one and two day short courses provide you with intensive skills development, whatever your initial skills level. Our highly skilled jewellery tutors work with you on an individual basis, assisting you to make something truly amazing.